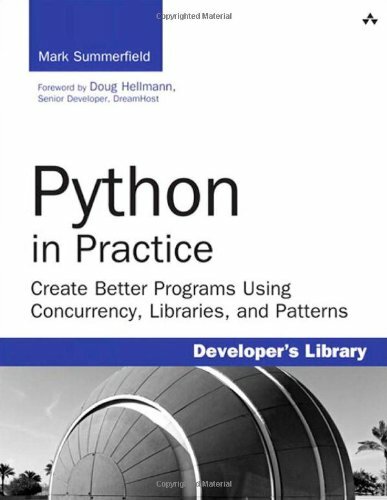 If you’re an experienced Python programmer, Python in Practice will help you improve the quality, reliability, speed, maintainability, and usability of all your Python programs. Mark Summerfield focuses on four key themes: design patterns for coding elegance, faster processing through concurrency and compiled Python (Cython), high-level networking, and graphics. He identifies well-proven design patterns that are useful in Python, illuminates them with expert-quality code, and explains why some object-oriented design patterns are irrelevant to Python. He also explodes several counterproductive myths about Python programming–showing, for example, how Python can take full advantage of multicore hardware. All examples, including three complete case studies, have been tested with Python 3.3 (and, where possible, Python 3.2 and 3.1) and crafted to maintain compatibility with future Python 3.x versions. All code has been tested on Linux, and most code has also been tested on OS X and Windows. All code may be downloaded at www.qtrac.eu/pipbook.html.